Arkala OH8X possibly the most advanced radio DX sports station in the world. I'm always inspired when I see my fellow humans operating at the extremes, whether it is climbing K2 , sailing solo around the world or walking on the moon. The ability of humans to push the boundaries is what got us out of the trees and opened up all the possibilities before us. Radio amateurs are not normally associated with operating at the extremes though I would argue that this is not always the case, but an amateur radio project near Finland's Arctic Circle is at the extreme in every sense of the word and is certainly pushing the boundaries of what most of us believed was possible. 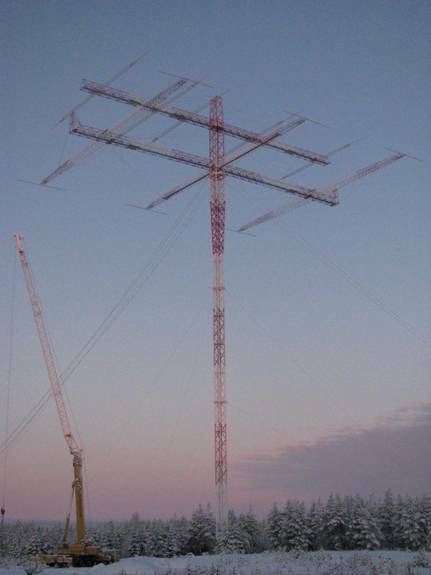 Arkala OH8X possibly the most advanced radio DX sports station in the world is located at 65.18degN, 26.24degE near Finland's Arctic Circle. The site is a cluster of some of the larges amateur radio antennas in the world. Radio Arkala OH8X was the inspiration of Juha Hulkko (OH8NC) and Veijo Kontas (OH6KN) after a discussion back in 2001 which resulted in the procured land near the Northern Taiga forests known as Arkala estate in June 2003. The site located about 60km from the city of Oulu with near by access to power and roads, but far enough away as they put it; from TVI customers. By late 2003 the ham shack and three antenna masts known as M2, M3 and M4 were constructed. The stations mission statement established in 2007 is to providing an alternative way to promote amateur radio activity among young people by establishing a team of skilled participants. Targeting and conducting competitive activities at extreme level as their way of self-education and self-satisfaction to boost interest among those who seek and value competitive amateur radio as an option. The mission statement has resulted in the following aim. Create the ultimate dream station. Capitalize on the innovative amateur radio heritage of Finland . Utilize the technical, conceptual and competitive strength of OH8X team. Competing radio stations/operators and general amateur radio operators. By 2008 the station was fully automated with use of a touch-screen cockpit presentation and was being acknowledged as a major player within the world amateur radio community. 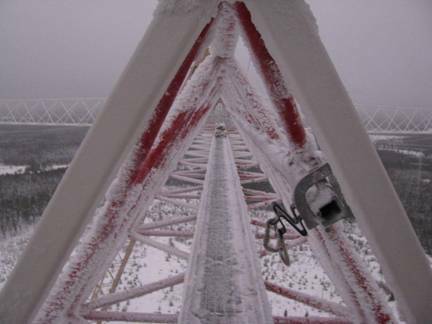 If all this was not challenge enough, in December 2008 the final work was being completed on a monster 3 element 160m band steerable yagi antenna. The so called M7 100metre mast supports not only the 160m band 3 element yagi, but also has a 5 element yagi for the 80m band. The M7 mast complete with 80m and 160m yagi antenna during final construction. Length 59m and all elements have 12m capacitive hats. Each of the elements uses 700m of tubing. The triangular 160m boom (2.2 m) comes with a rail for walking inside it. A view along the walk way within the 160m yagi boom. What can one say! 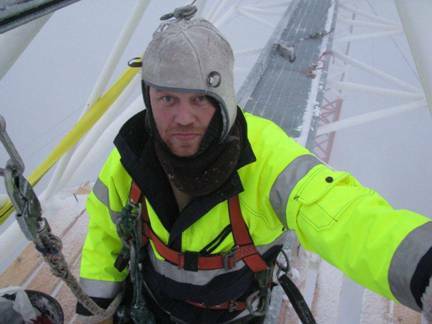 Pekka OH7RM working to remove ice from within the mighty 160m yagi's boom. Ice build up known as Tykky caused by water droplets freezing to the antenna structure adds tones destructive weight that must be removed. Team members work constantly to remove excessive ice from all the antennas. 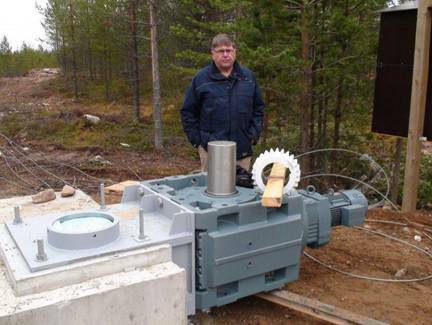 As mentioned earlier the antenna mast is steerable and here is Martti, OH2BH standing next to the rotator’s 7kW motor and gearbox. Each of the four guy wires extend 120 meters from the tower, representing an area of almost three hectares. The structure has approximately 450 meters of heavy duty tower sections. And finally 600 litres of paint! The idea of a forty metre band yagi used to impress me, now that seems more like a TV antenna. The information contained in this article has been obtained with permission from the Radio Arkala OH8X web site. OH8X a station to listen out for!